One of the companies selling London 2012 tickets to European customers has stopped taking orders following a flood of requests. The website of UK-based Sportsworld, which is selling tickets to Denmark, was inundated after the Sunday Times alerted British readers to it. Under EU law all European citizens are entitled to apply for these tickets. 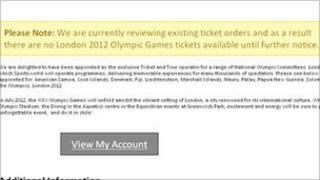 London 2012 organisers have warned fans buying tickets from foreign websites to be "extremely cautious" about touts. Meanwhile in the UK sports fans are still waiting to hear whether they have been allocated tickets in the controversial ballot system. Anyone trying to book tickets via the Sportsworld website on Monday received a message saying: "Please Note: We are currently reviewing existing ticket orders and as a result there are no London 2012 Olympic Games tickets available until further notice." It is the official seller to a dozen countries but Denmark is the only one of them which is in the EU. Under EU law all European citizens are entitled to apply for these tickets, in the same way that Danish citizens were entitled to apply via the London 2012 website as part of the main application process. A reporter for the Sunday Times bought a pair of tickets for the athletics finals on 9 August from another source - German agent Dertour. The BBC's sports news correspondent James Pearce says it is still possible to buy tickets to boxing finals, canoe slalom finals, the women's basketball final and other high profile events through Dertour, which is continuing to sell tickets on a first come first served basis. "Meanwhile, applicants via the main London 2012 site continue to express their frustration that their credit/debit cards have not been debited," he said. "The London 2012 organising committee has promised that 60% will have been debited by Wednesday but the BBC has still not come across a single applicant who has had a card debited." A spokesman for organising committee Locog said one million tickets had been allocated to Olympic committees in about 200 countries outside the UK. "There are a number of unofficial websites claiming to sell tickets, we therefore advise people to be extremely cautious and vigilant when attempting to buy tickets and only purchase from an official source - if in doubt there is a url checker on our website which will identify official sources, " he added. Locog itself has 6.6 million tickets available to the general public via the application process. Some 1.8 million people have applied for the tickets, with a total of 20 million ticket applications. The prices range from £20 to £725 for the showpiece 100 metres final and reach £2,012 for the opening ceremony on 27 July. In total, 8.8 million tickets are available for the Olympic Games, with a further two million available for the Paralympic Games, which go on sale later this year. About half of the remaining 2.2 million tickets have been issued to National Olympic Committees (NOC), with the other half split between sponsors, the International Olympic Committee (IOC), guests and hospitality partners.